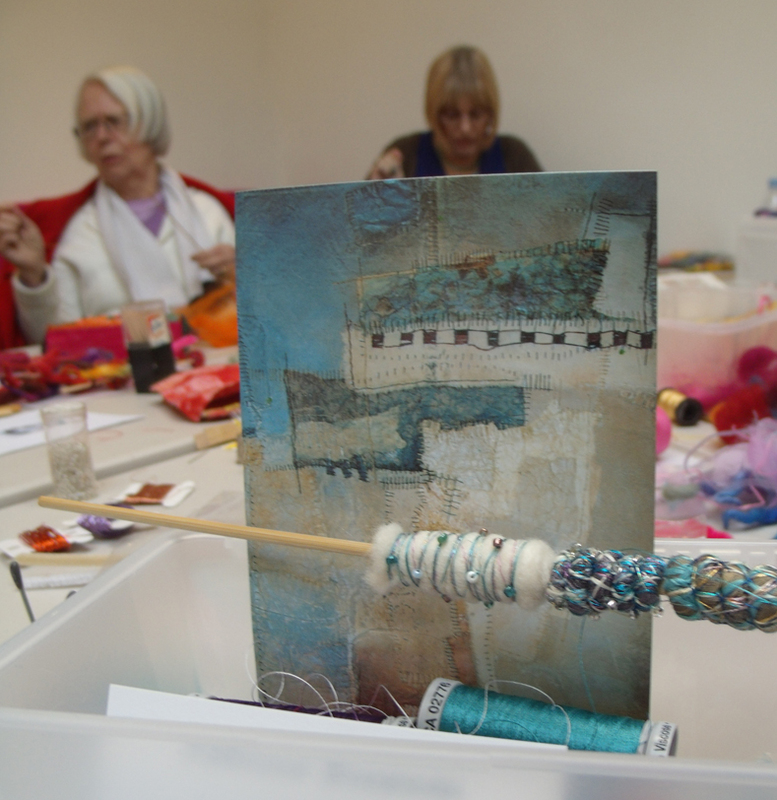 Heart Space Studios is one year old this week, so we repeated our first ever class, Making Fabric Beads with Patricia Brownen, and the results are as desirable as always. 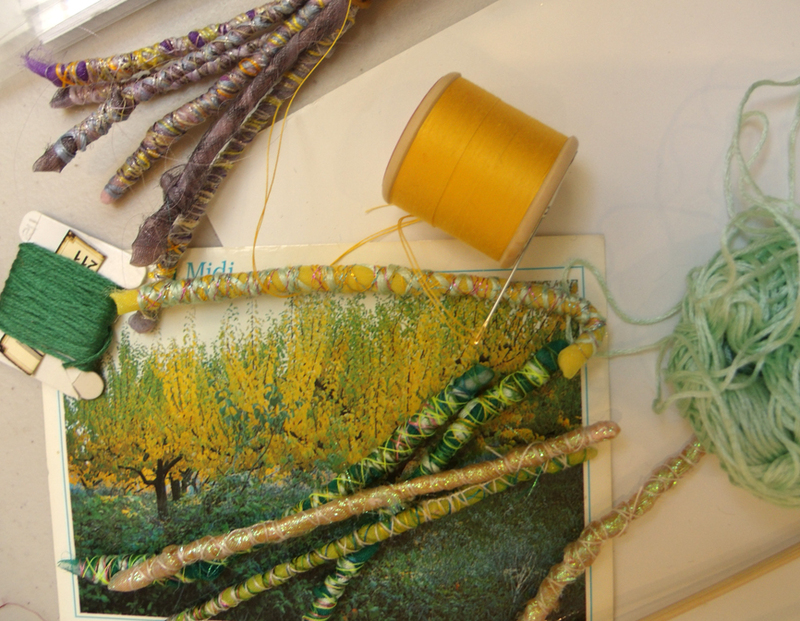 This is one of our most popular classes and the original report also receives many hits on this blog, so I thought I would show the successful process of designing and making the beads. 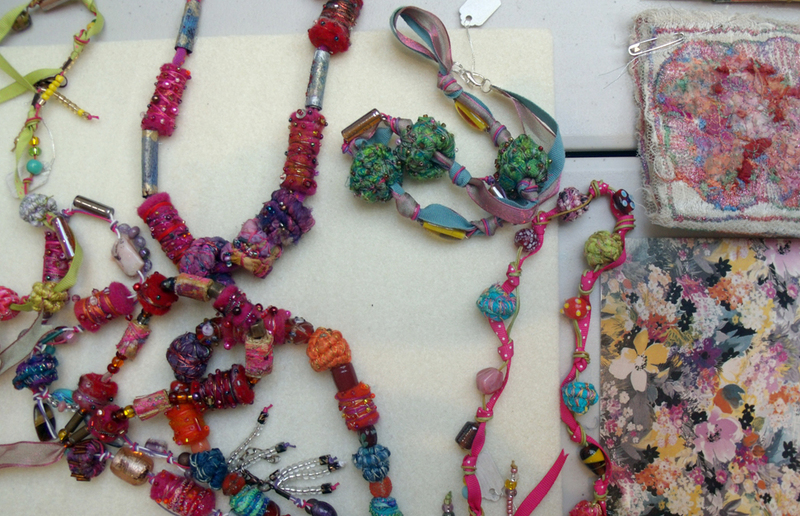 Patricia always brings in lots of lovely fabrics and unusual materials, as well as her own jewellry, as inspiration. 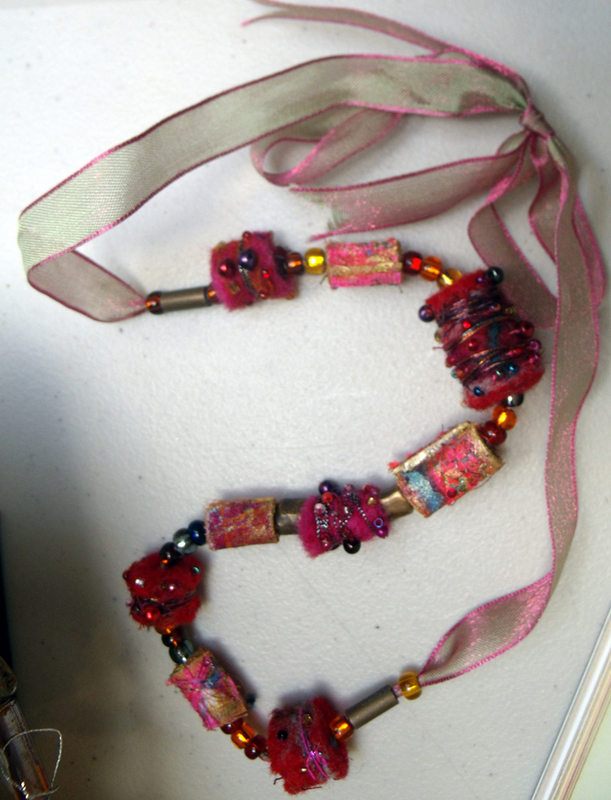 She uses a simple device for designing and making a whole set of co-ordinating coloured beads for a single necklace: – picture postcards. 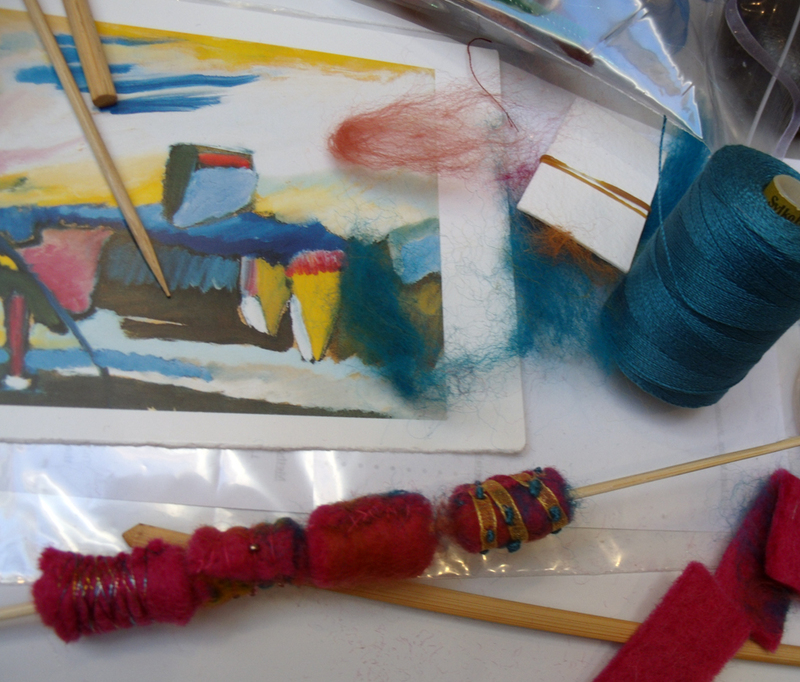 Students get to choose from whole range of different postcards, from impressionist paintings to modern textiles, anything where colour is paramount and abstract images are better than figurative, but you could make your own inspirational cards….. 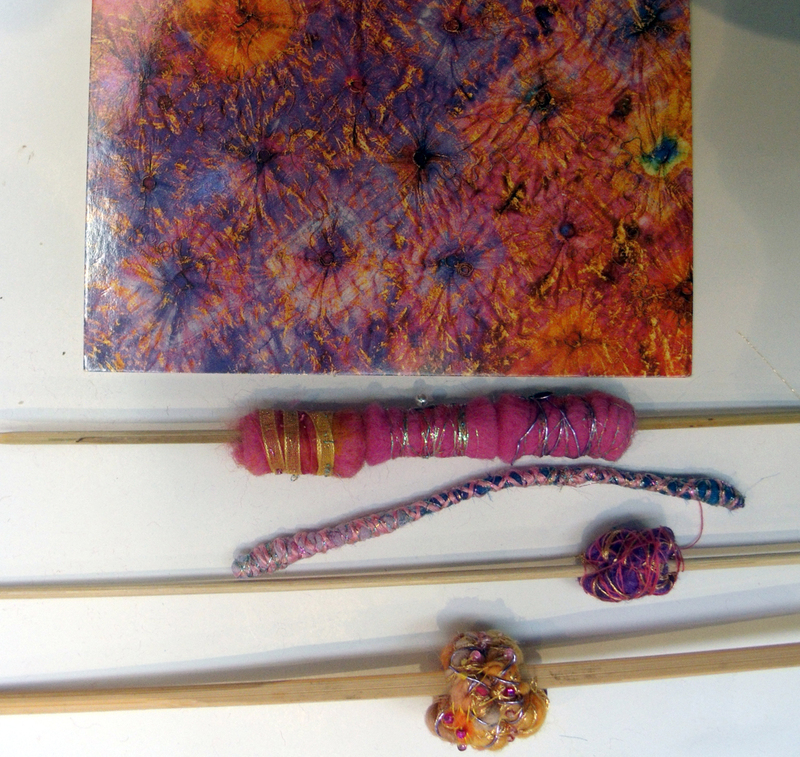 There are 2 types of bead made in the workshop, one involves rolling pipe cleaners with fabric and threads and then stitching through the roll to hold everything into position, the second type is rolled felt that can be needle felted and wrapped and secured with coloured threads. 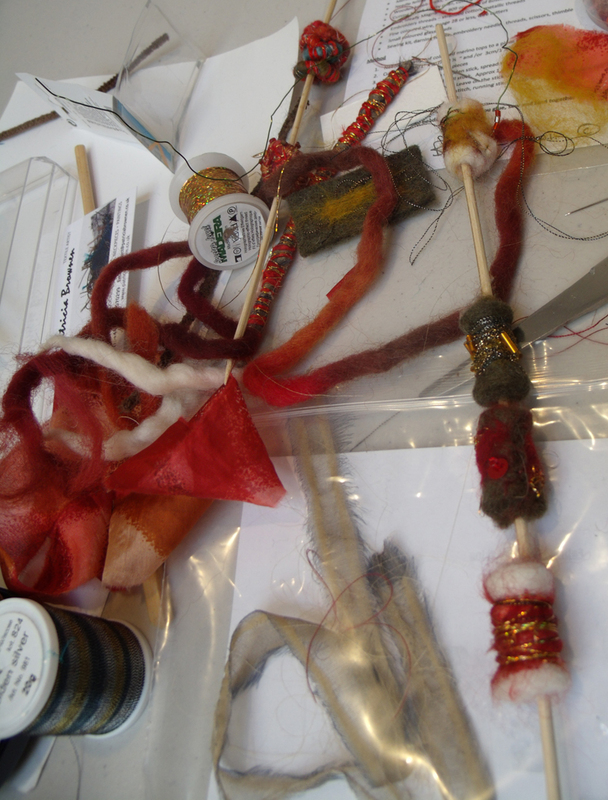 a whole range of different materials for bead making on skewers. 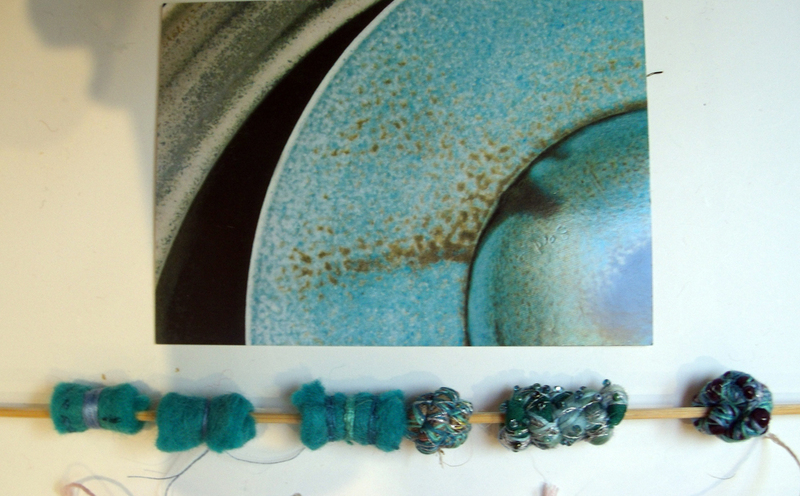 These 2 simple systems used to make the beads means that choosing colours and experimenting with textures is a an exciting and immediate process. 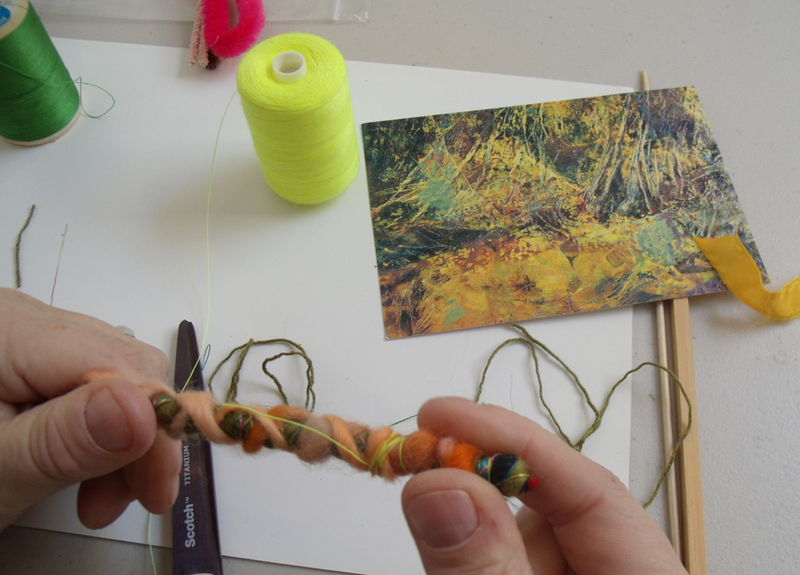 rolling fleece and ribbons round a pipe cleaner start off the bead. 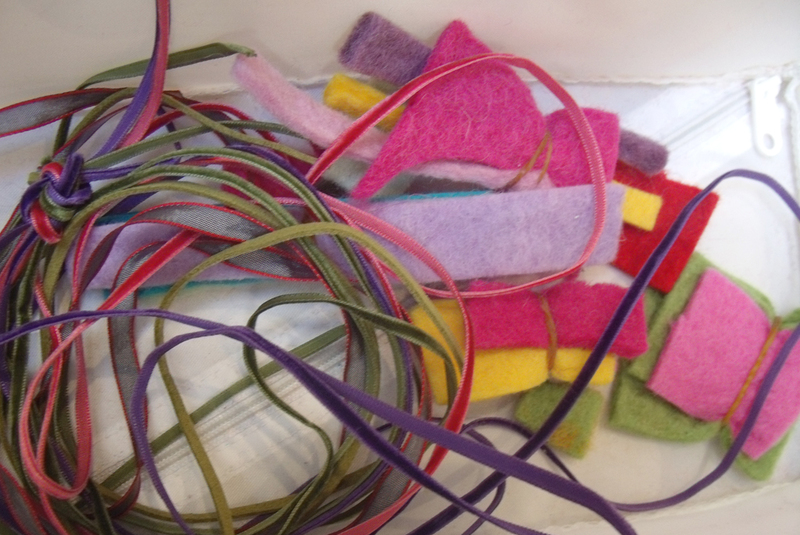 To ensure colour co-ordination several rolls of pipe cleaners can be made together before rolling onto a wooden skewer to form separate beads. 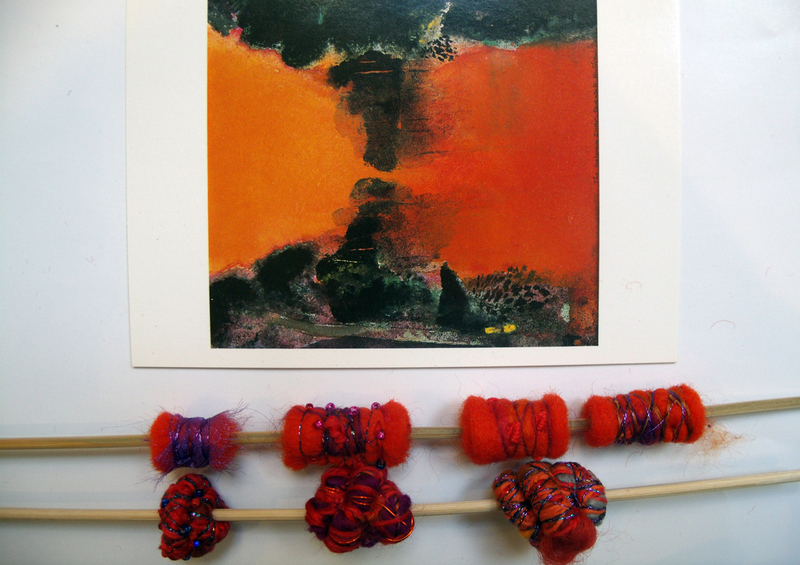 several stages of making pipe cleaner beads. 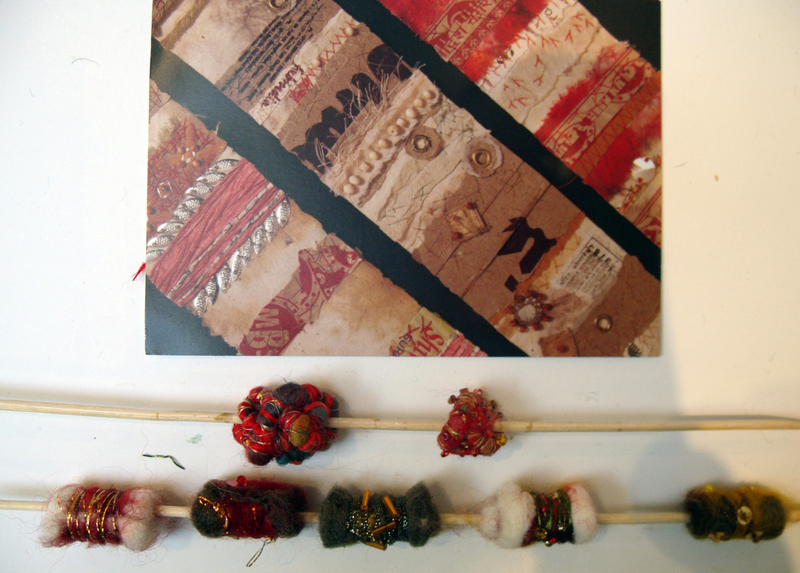 The long felt beads can be made in very subtle shades when they are needle felted first with scraps of fleece. 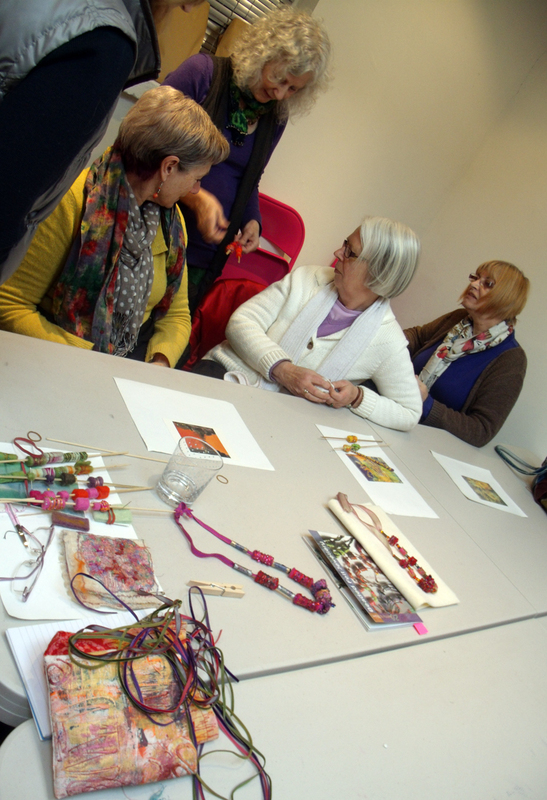 At the end of the day’s session everyone displayed their beads with the inspirational card,the class discussed the next steps – making more at home, then stringing them together. 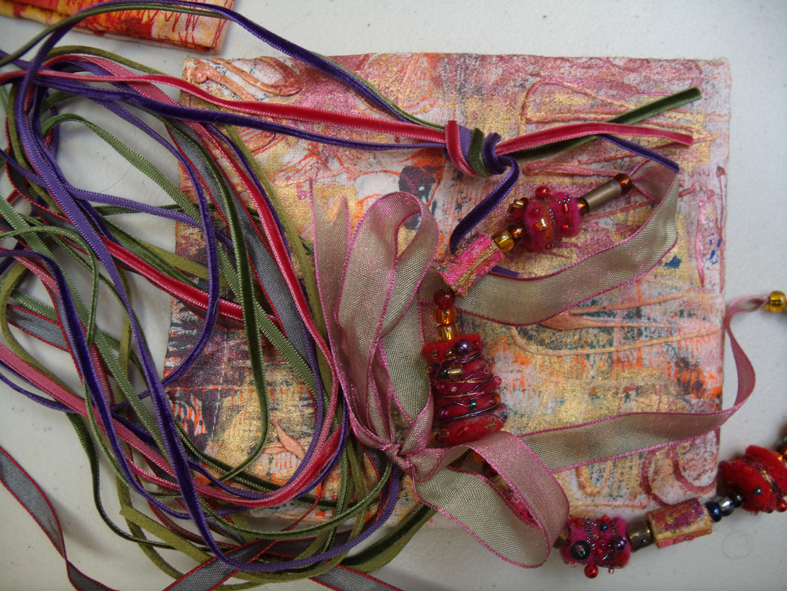 Patricia showed the group a simple stringing system using a pretty toning ribbon. These are so wonderful. 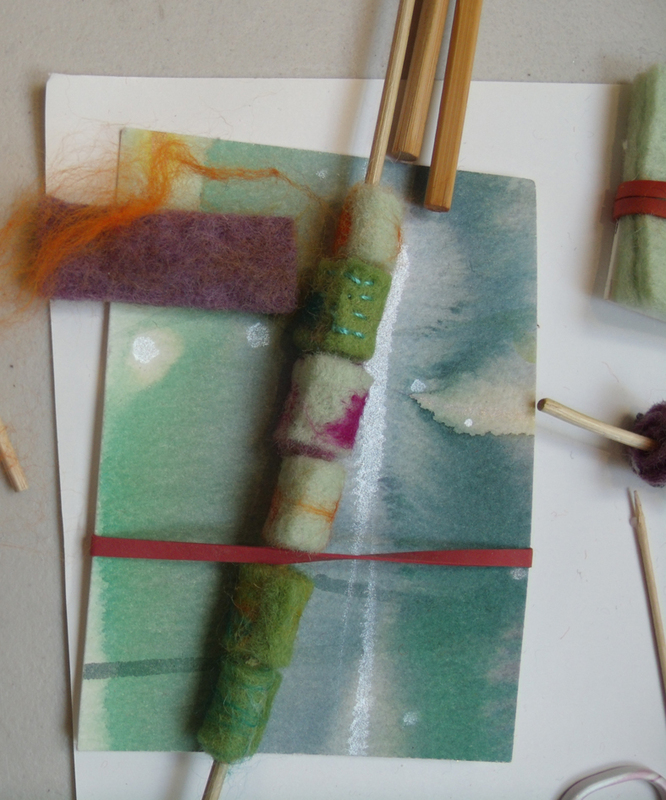 How can I find out more about some of the classes you will offer later this summer? 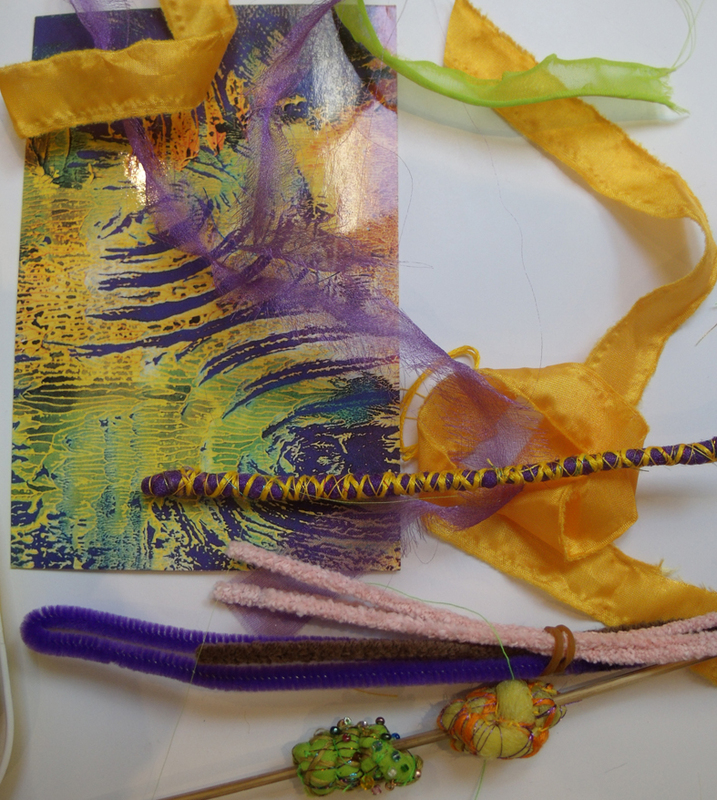 well thanks for this message, just what I wanted – new people to join us at Heart Space…so if you click on to the highlighted “popular classes” in the second line of the text you should get to the page on the website for the next workshop in March. 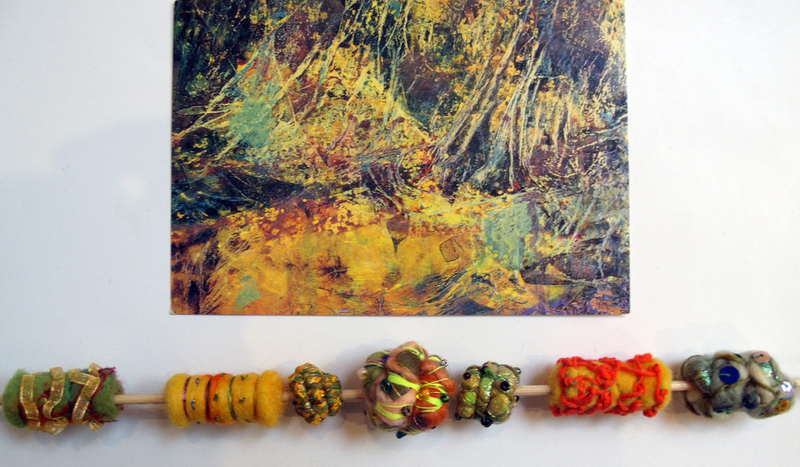 I warn you though making these beads is addictive.